Early 19th century lithograph by Charles Fenderich, showing the U.S. Capitol Building. Courtesy of the Library of Congress. States with Capitol Buildings featuring prominent exterior cupolas are highlighted in yellow. Historical information appearing on this page comes from the same sources acknowledged on the first page of this gallery. Click on any picture to see an enlarged version, or to view the other historic images available in the Cupolas of Capitalism Picture Gallery. Note as previously mentioned, the 3D links from Google and MS Bing may require a browser plug-in and repeated loading to display correctly. California Sacramento Capitol Mall & 10th St. / bird's eye view rotated to show front from MS Bing; street and 3D view from Google Maps; and 3D model from 3D Warehouse. 1856, Capitol designed and construction begins. Work starts and stops due to political wrangling / Reuben Clark. 1860-65, Capitol completely redesigned and construction begun again / Miner F. Butler (designer) with Reuben Clark appointed superintendent of construction. Clark goes on leave for health reasons in the Fall of 1865; is committed to Stockton Insane Asylum in February 1866; and dies there on July 4, 1866. 1865-1870, construction continues / G. Parker Cummings. 1870-71, construction continues / Henry Kenitzer and A .A. Bennett. 1872-74, construction completed / G. Parker Cummings again. 1906-08, first major remodel, mainly an interior modernization that added new office space and a fourth floor. Senate and assembly chambers gutted and reworked in the process. Little change to the exterior / ? architect. 1949-52, semicircular apse in rear removed, and the Art Deco / International Style influenced East Wing, a substantial addition, built in its place / Alfred Eichler. 1975-82, Capitol restoration / Welton Becket Associates. 2001, repairs and security driven changes after limited damage to south entrance from truck attack and subsequent fire. Italian Renaissance Revival state capitol building. Central circular drum tower is capped with a copper covered dome and cupola. 220 feet tall. Pictures, tours, and more info at the California State Capitol Museum. Also available is this detailed, illustrated history in Adobe Acrobat format from the California State Legislature. More building photos appear on the site of photographer Edward Crim, and a photo essay, appears on Donald Laird's California Landmarks site. Colorado Denver 200 E. Colfax Ave. (between Lincoln & Grant Streets) / bird's eye view rotated to show front from MS Bing; street and 3D view from Google Maps; and 3D model from 3D Warehouse. 1886-1898, designed and construction started / Elijah E. Myers. 1898-1907, construction completed / Frank E. Edbrooke. 2000-2009, fire safety upgrades / Fentress Architects. 2011-2014, dome restoration / Quinn Evans Architects with Humphries|Poli Architects. Italian Renaissance Revival state capitol building. Central circular drum tower is capped with a gold gilded dome and cupola. 276 feet tall. More info offsite with official virtual tours of the building and its dome, and an article about the dome restoration. A fine photo album from Edward Crim is also available. (Old State House & New State Capitol) Old State House at 800 Main St. (near State St.) / bird's eye view rotated to show East Front at end of State St. from MS Bing; street and 3D view from Google Maps; and 3D model from 3D Warehouse. 1792-96, Old State House designed and built / Charles Bullfinch. 1822, cupola tower added to Old State House (possibly part of the original design), copied from the Old City Hall in New York City / ? architect. 1878-79, major remodel of Old State House by the City of Hartford removes original spiral stair in the Great Hall and squeezes a new third floor out of the high second floor rooms / ? architect. 1922, restoration removes extra floor added in 1878, building made fireproof, and steel roof trusses added. Monumental stair in Great Hall is not the original Bulfinch design. New State Capitol at 2210 Capitol Ave. (at Trinity St.) / bird's eye view rotated to show South Front facing Bushnell Park from MS Bing; street and 3D view from Google Maps; and 3D model from 3D Warehouse. 1872-79, New State Capitol designed and built / Richard M. Upjohn. 1977-89, exterior and interior restoration of New State Capitol / Dominick C. Cimino Architect Planners. The Old State House is in the Federal style with a cupola tower. Capped with a statue called Blind Justice. Picture and more info offsite in this official description. The New State Capitol is a mixture of Gothic and French Renaissance Revival. Central circular drum tower is capped with a gold leafed dome and cupola. Approx. 257 feet tall. More offsite with tour info, building facts, history, and picture galleries from the Connecticut General Assembly. Other government offerings include a pdf picture book and a basic building description. The Bushnell Park website features a short building history. Edward Crim has posted a substantial gallery of building photos on his website. Cornell University offers an old magazine review of the original construction. (Old State House & New Legislative Hall) Old State House at 25 The Green (off S. State St.) / bird's eye view rotated to show front from MS Bing; street and 3D view from Google Maps. 1787-92, Old State House designed and built. Now a museum / Alexander Givan. 1873-75, mansard roof and central front tower added, hiding original front door and Palladian window. The alterations are reversed in a later restoration / ? architect. 1836-1926, various additions / ? architect(s). 1910, original roofline and second floor windows restored / ? architect. 1974-76, major exterior and interior restoration of Old State House / ? architect. Sept. 2004- Oct. 2007, Old State House restoration and ADA compliance work. Exterior bricks repointed. Roof, exterior doors and windows replaced. Interior repainted in historic scheme, plaster walls patched, floors restored, new HVAC and fire suppression systems added, electrical and plumbing systems upgraded / Bernardon Haber Holloway, Architects, PC., with Frens and Frens, LLC Restoration Architects. New Legislative Hall at 411 Legislative Ave. (at Duke of York St., near west end of Court St.) / bird's eye view rotated to show forecourt from MS Bing; street and 3D view from Google Maps; and 3D model from 3D Warehouse. 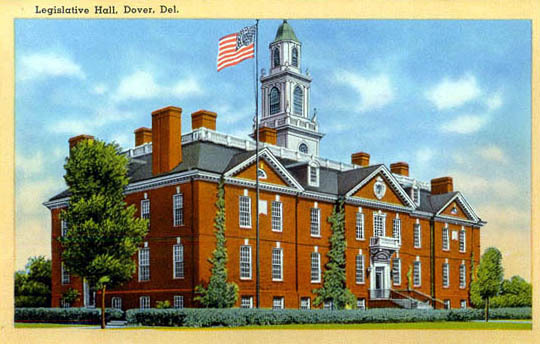 1931-33, Legislative Hall designed and built (New State House) / William Martin. 1965-70, extension of North and South Wings on Legislative Hall / George Fletcher Bennet. 1994-96, two new projecting wings added to east side of Legislative Hall, creating a forecourt / The Architects Studio. 1994-97, major interior renovations of Legislative Hall, including both chambers, the lobby, cafeteria, and offices / Moeckel Carbonell Associates, Inc. The Georgian style Old State House features a central rooftop cupola. More info is available offsite through the Delaware State Museum website. The State of Delaware website also offers this panorama of the first floor. Their discontinued photo essay on the recent restoration still hangs on thanks to the Internet Archive. Historic postcards show the old capitol with its mansard roof and tower here and here. A 1930s front view shows the west side of new Legislative Hall visible in the distance. The Georgian Revival Legislative Hall is 90 feet tall with a central cupola tower. More info offsite with an official virtual tour (and similarly appearing here) and building history. Historic postcard views show the state capitol before its first 1965 wing additions (also here), as does this 1930's period photo. This historic view of the east side shows the building after the first and before the second wing additions. An album from Edward Crim helps round out the photographic coverage. A short photo essay is available on the state capitol focused website of Valerie Mockaitis. District of Columbia Washington First & E. Capitol Streets NE. / security obscured bird's eye view rotated to show East Front from MS Bing; street and maybe a forthcoming 3D view from Google Maps; and 3D model from 3D Warehouse. 1793-1800, North Wing designed and built / designed by William Thornton. Work supervised by architects Steven Hallet(1793-94); George Hadfield (1795-98); and James Hoban (1798-1800). 1803-11, South Wing, rebuilt interior of North Wing / Benjamin Henry Latrobe. Aug. 24, 1814, Capitol burned (but not completely destroyed) by British troops in War of 1812. 1814-17, restoration begun by Benjamin Henry Latrobe. 1818-30, restoration finished and central portion built with a wooden dome / Charles Bulfinch. 1850-63, North and South Wing extensions and new, taller central dome and cupola / Thomas Ustick Walter (resigned in 1865). Capitol is essentially complete in 1863. 1865-1902, various modernizations to Capitol / Edward Clark serving as Capitol architect. Frederick Law Olmsted designed the landscaping for the Capitol grounds during this period. 1902-1923, various modernizations to Capitol / Elliott Woods serving as Capitol architect. 1923-1954, various modernizations to Capitol / David Lynn serving as Capitol architect. 1954-70, various modernizations to Capitol, with 1958-62 extension to East Front and repairs to dome / J. George Stewart serving as Capitol architect. 1971-95, various modernizations and restorations, power plant enlarged, and several separate Capitol complex buildings added / George Malcolm White serving as Capitol architect. 1991-2008, addition of the subterranean Capitol Visitor Center, which at 580,000 s.f., is nearly three-fourths the size of the 775,000 s.f. capitol building itself. Building construction began in 2001 / RTKL Associates Inc.
1996-present, ongoing restoration of Brumidi corridors / Alan M. Hantman and Stephen T. Ayers serving as Capitol architects. late 2013-present, restoration of dome and exterior terraces, and repairs to windows and building plaster / Stephen T. Ayers serving as Capitol architect. Group of old capitol columns at Ellipse Rd. NE. & Beechwood Rd. NE. / bird's eye view rotated to show front from MS Bing; and photos, street and maybe a forthcoming 3D view from Google Maps. 1988, old capitol columns removed in East Front extension and installed as a garden sculpture in the U.S. National Arboretum in Washington, D.C. / Russell Page, landscape designer. The United States Capitol Building is composed of an original Federal Style central core, and several sympathetic Neoclassical additions. It features a central circular drum tower capped with a large cast iron dome and cupola. 287 feet, 5 1/2 inches tall. The cupola is capped with the Statue of Freedom. Extensive info available offsite at the official Architect of the U.S. Capitol site, with detailed building histories, photos, drawings, and virtual tours. The U.S. Senate offers visiting information and a virtual tour on their site. The Library of Congress website includes an exhibit called the Temple of Liberty. It chronicles the design, construction, and development of the capitol through a cornucopia of historic drawings photos. The website of the U.S. Capitol Historical Society includes an online tour and other historical exhibits of the building and its contents. Preservation magazine's columnist Dwight Young has also posted photos from his 2009 tour up into the capitol's dome and cupola. A picture of the garden sculpture made from the old U.S. capitol columns is available onsite. Offsite, the U.S. National Arboretum offers a short photo essay on the structure. Other photos are available here.